In all of its 50s glory! There were parts of this movie where I doubted my choice. Was I going to have another Jerry McGuire on my hand? In other words, a movie that only half-committed to work critical themes and even then not very well? 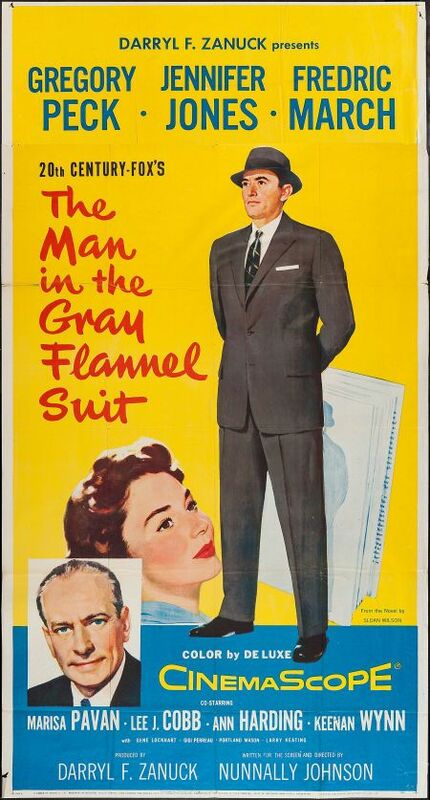 Thankfully, The Man in the Gray Flannel Suit far surpassed Jerry McGuire in many areas and on many levels. The story is centered around a man named Thomas Rath and his family. Rath (played by Gregory Peck) was in World War II and suffers from PTSD. He is also a family man whose trying to balance his finances with the concerns of his wife and the salaries of his job. Adding on to that is the life of a a Mr. Hopkins (played by Fredric March). Hopkins and Rath are both played as counterparts to great effect. Rath is a family man who doesn’t like or want the rat race. He’s often a very honest person who is even described as “cynical” by his wife at one point. But his desire for a better life and especially a better life for his wife and family leaves him to ethical quandaries. Should he lie to get his bosses favor? Or should he tell the truth and risk getting fired? Hopkins is the boss in question in this particular situation. An individual who has all but forgotten his family, abandoned his daughter (Susan) to alcoholism and dating older men who may be exploiting her for companionship. Nevertheless, Susan (played by Gigi Perreau) is perhaps the closest thing this movie gets to an anti-work perspective and thus was one of my favorite parts of this film. She lucidly tears her father’s arguments for work apart and declares his motivations manufactured alongside some sort of “guilt complex” and masochism, saying she doesn’t want to work at all. Then again, she can only afford this because she’s dating a rather wealthy man and has wealthy parents to begin with. Not to mention the fact that Susan is white and so has that privilege as well in her desires to abstain from work. That said, her criticisms of her father are solid and are worth paying attention to. Meanwhile Hopkins is shown throughout the movie to have thrown almost everything into his company and yet claims this is the only way successful businesses are made. But the movie (as well as the book it is based on) ask us to consider: Is it worth it? Is it worth sacrificing some of the most important people in our lives, just to get ahead in the world? Is work more important to us than our families and social lives? Is work more important than resting? Although the film isn’t as critical as I’d like it to be of these questions, it at least acknowledges that they are questions and ones worth asking. It tackles these questions in interesting and sometimes emotionally moving ways. Rath constantly wants to do the right thing but he also wants to make sure he does right by his family. This sets up the central conflict in the film, often with bosses and the structures of the corporation he works for being an antagonist of a sort. As Rath says, it’s easier to be in a good bargaining position when you have multiple possibilities and some money to fall back on. But when you only have one job and a family, you are often forced to be very particular in the information you give to your bosses. What if they fire you? What if you lose the job even temporarily and have a back up? Some of these questions are irrelevant for people like me: I don’t want a family. And I’ll admit that all of that is partly why. I want society to tie me down to its demands as little as possible. And part of that (for me) means not having children or getting married and buying a house, etc. I’m comfortable living in apartments and being without children or marriage. That doesn’t mean I don’t understand why some people want otherwise. But many of the things that require credit scores and joining the “rat race” don’t appeal to me. And of course I have other reasons for not having children besides wanting to work less and have society exert less control over me. But that’s one part of it. And Rath’s wife (played by Jennifer Jones) makes an excellent point about all of this dishonesty. Doesn’t it sink into your personal relationships? Wouldn’t eventually you justify the way you act at work with the way you act at home? Wouldn’t you just keep telling people what they want to hear, even if it’s not what they need to hear? There’s some truth to this concern. I’m honest with my bosses most of the time but I also neglect to give some information so I don’t have to lie. Usually I’m not good at lying so I don’t even try. For instance if I haven’t gotten a lot done with regards to a certain task I’ll usually play it off as a joke and say I’ll get on it. But I don’t deny I didn’t do much. So in that way, I make sure that the way I relate to my bosses doesn’t differ terribly from the way I deal with everyone else, as much as I can help it. But when I can’t, well you’d be amazed at how well people can compartmentalize themselves and the way they handle some folks as opposed to others. There are other themes in this movie, themes of war and PTSD as well as marriage and love. These themes were also well-done and worth mentioning. Especially as they intersect with the collective demands that society makes on us for work, similarly it can do so for war or our expectations around love and what it looks like. I noticed there were some small sentiments of anti-technology or at least cautioning against letting children watching television too much and becoming distant from everyone else. Given this movie was made in the 50s it’s easy to look back on these claims and laugh. If anything, technology has helped many families come together, especially TV. Regardless, the broader themes of this movie about finding your way through corporations and the hardships of dealing with dishonest bosses should resonate with anti-work folks. The movie will never go as far as we might like it to, but that’s probably not a reasonable expectation to have in the first place. Given when the movie was made (1956, a year after the novel) I think the amount of criticisms it gives towards war and corporations is admirable, to say the least. Definitely worth watching for some great work-critical and even war-critical themes. And unlike Jerry McGuire, the love story elements in this movie actually work. If you enjoyed this movie review, consider donating to my Patreon! Hi Doreen. Its good to have you back, I know you explained in the update that you had still posted quite a bit in the month but it did feel like there was a bit of a dry spell. I havent heard of this film, perhaps it isnt shown much in the UK or maybe its on in the daytime. They dont usually show anything 40+ years old on any channel in the evenings. I’ll try to find it online. Another old movie which goes largely unrecognised as a critique of (some) elements of business and job obsession is ‘its a wonderful life’. Obviously people tend to focus on its mushy ending rather than the first 40 mins or so. Yeah, I still managed to post a bunch but as I said, I wanted a little vacation around my birthday. I’m planning on some consecutive posts now that I’m off work till Sunday but we’ll see! Hm. I actually have never seen that, I’ll add it to the list, thanks!